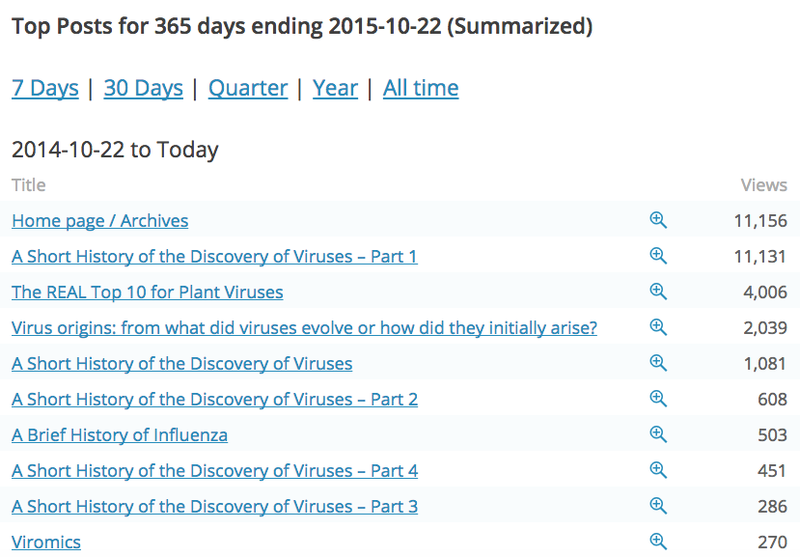 I was prompted to this post by the breathless and much-hyped response to the discovery – the repeated discovery should I say; there was an earlier one that gets glossed over – of a multicomponent flavirus-like virus, this time in mosquitoes. 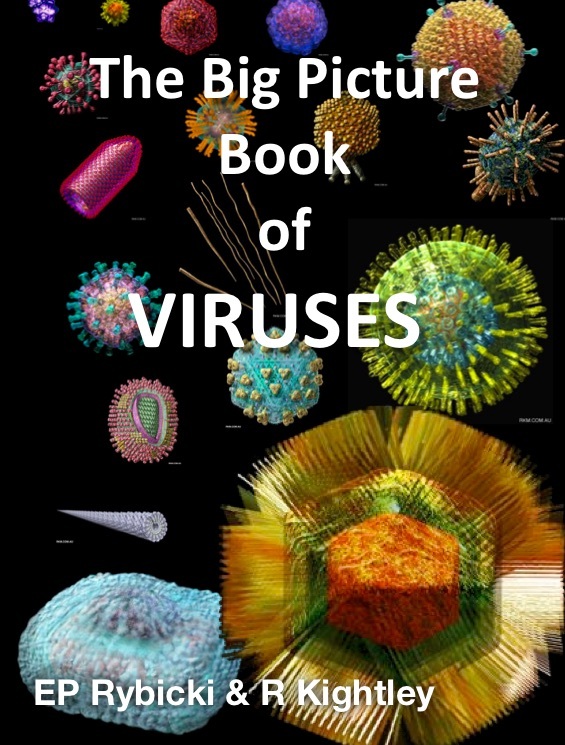 …which is why there’s all the hype, of course: claiming the virus “…breaks the rules of infection” is simply incorrect, because it is in fact related to very well characterised single-component ssRNA+ viruses of arthropods and mammals – flaviviruses – and infects its mosquito host exactly as these do, except with its genome in separate particles. Which makes it similar to quite a few plant viruses, several of which are, incidentally, probably evolutionarily related to viruses infecting insects – but more later. Thus, a claim like “…a new study published Thursday is making researchers rethink how some viruses could infect animals” is simply hype. But it is a sort of hype familiar to plant virologists, who after all showed that multicomponent viruses (=viruses with multipartite genomes packaged in separate particles) existed over 50 years ago – and who also showed that gene silencing was a factor in plant resistance to viruses long before their better-funded animal-researching colleagues got in on the act, but that is another story. The way in which multicomponency was discovered with plant viruses is interesting: it relied on the fact that plants can respond with local lesions – qualitatively the same as plaques in bacterial or animal cell lawns – to mechanical infection, and that this can be used an an accurate assay of virus titre, as for phages or animal viruses (see here). It became evident, though, that certain plant viruses produced significantly steeper lesion vs dilution curves than were expected from “one-hit” kinetics, where infection with a single virus particle sufficed to cause a lesion. This is best shown by a plot like the one below, modified from REF Matthews’ Virology, 3rd Edn, attributed to Lous van Vloten-Doting from 1968. This shows the curves obtained from accurate and painstaking local lesion assays with the single-component Tobacco necrosis virus (TNV), and the multicomponent Alfalfa mosaic virus (AMV): both are ssRNA+ and have isometric particles, but TNV has a single-component genome, and AMV a tripartite genome packaged in 3 particles. …but with the addition of rapid sequencing techniques not available in 1968, to show that indeed, the different segments were 5 distinct pieces of ssRNA, 3 mono- and 2 tricistronic (=3 ORFs), with the 2 largest monocistronic pieces being similar to flavivirus NSPs and the 3 smallest not encoding anything similar to sequences in the databases. Four RNAs were essential for infectivity, while the smallest appeared dispensable. Particles formed during infection of cultured cells were enveloped and 30-35 nm in diameter, considerably smaller than flavivirus virions. They were also wrong: there are a number of viruses for which this could have been said years ago, like the picornavirus superfamily-related comoviruses of plants. These have two-component genomes which both encode polyproteins, one with non-structural and the other with structural ORFs. In fact, an evolutionary precursor to such viruses could be the more closely picornavirus-related dicistroviruses of insects, which have a classic picornavirus precursor polyprotein ORF split into two, with the structural protein ORF at the 3′ end and the regulatory or non-structural polyprotein at the 5′ end. I got into this because it irked me mildly that such a fuss was being made of a second group of animal-infecting multicomponent ssRNA viruses, when the multicomponent plant virus precedent and history was VERY well established – but then got more interested when speculation started about what advantage multicomponency could confer on a virus. I have thought for years that people discussing this generally have it backwards: it’s not that having a divided genome in separate particles offers advantage(s), it’s that it is not a DISadvantage in some circumstances – and particularly where there is no selection against the state. A reason that multicomponency HAS been seen quite frequently with plant viruses could be that mechanically-transmitted viruses can reach VERY high concentrations in infected plants, and even obligately vector-transmitted viruses (eg: the bicomponent ssDNA begomoviruses, multicomponent ssDNA nanoviruses) reach quite high concentrations in the phloem tissue to and from which they are transmitted, compared to viruses in vertebrates. This is also true for viruses of arthropods compared to vertebrate viruses: dicistroviruses in aphids can reach concentrations that are comparable to those of viruses like TMV in plants, to the point that aphids inject enough virus into plants that our lab originally mistook Rhopalosiphum padi virus for a plant virus. Moreover, plant virus virions often aggregate into quasi-crystalline arrays which can be hard to separate and which are even visible inside insect vectors, thus virtually guaranteeing that >1 virion will be present in any inoculum, even if significantly diluted. This is most definitely NOT the case for vertebrate viruses, even where the same virus infects both an arthropod and a vertebrate host: the titre in the latter is guaranteed to be orders of magnitude lower, largely due to a more sophisticated immune system keeping viraemia in check. Thus, high inoculum concentrations relative to vertebrate viruses, and a tendency to aggregate, mean there is no DISadvantage inherent in multicomponency. Thus, multicomponent viruses may achieve the sorts of gene dosage control only possible in viruses with larger genomes, by virtue of having multiple genome components rather than control elements which add genomic bulk. Another possible advantage that I recall being touted by plant virological luminaries is the ease of reassortment compared to recombination: this is exemplified by the reo- and orthomyxoviruses, albeit in vertebrates, where they are constrained by having to have all genome components in the same capsid to guarantee infectivity. Absolutely. And I think it’s a safe bet that a LOT more multicomponent viruses will be found in arthropods – and even in some vertebrates, to which they will have been transmitted by arthropods. Because that’s the link between many of these viruses: an evolutionary history that involves plants and arthropods, or arthropods and other animals, at an early stage of life on land. Because that’s all there was for advanced eukaryotes, early on: primitive vascular plants, insects that preyed on them and on each other, and protists. Virology Africa 2015: consider yourselves notified! Anna-Lise Williamson and I plan to have another in our irregular series of “Virology Africa” conferences in November-December 2015, in Cape Town. As previously, the conference will run over 3 days or so, possibly with associated workshops, and while the venue is not decided, we would like to base it at least partially in the Victoria & Alfred Waterfront. We also intend to cover the whole spectrum of virology, from human through animal to plant; clinical aspects and biotechnology. We intend to make it as cheap as possible so that students can come. We will also not be inviting a slate of international speakers, as we have found that we always get quite an impressive slate without having to fund them fully. It is also the intention to have a Plant Molecular Farming workshop – concentrating on plant-made vaccines – concurrently with the conference, in order to leverage existing bilateral travel grants with international partners. If anyone else has such grants that could be similarly leveraged, it would be greatly appreciated. See you in Cape Town in 2015! Giant Zombie Killer Virus Rises From Its 30 000 Year Grave To Kill Us All! Or Not? I am not a fan of “Science By Hype”, which I think I have made abundantly clear via Virology News and elsewhere. Thus, I pour scorn on the “We found a structure which will lead to an AIDS vaccine”, and “We found an antibody that will cure AIDS” type of articles, WHILE at the same time, appreciating the ACTUAL science behind the hype. If there is any, of course. Yeah. Rii-ii-ght. Giant viruses are going to erupt from the permafrost and kill us all! Really?? Amen! In other words, just because there ARE revivable viruses in permafrost – itself no new thing, BTW – does NOT mean they will harm humans. Think about this a moment: something locked away under the surface of the ground for 30 000+ years has to SURVIVE, first; second, it has to INFECT humans if it is to cause any harm. And what evidence do we have that anything found in Siberian permafrost can do that? 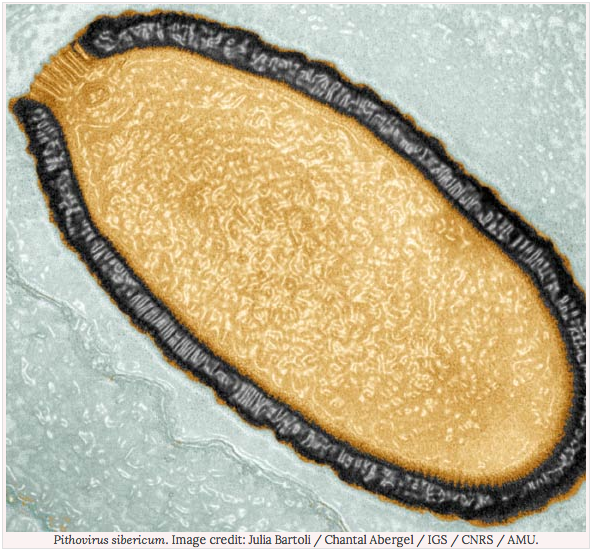 Think again: how many humans, and how many mammals with virus that could infect humans, were there around on the Siberian plains 30 000 years ago? And what likelihood is there that any viruses that COULD infect humans, got preserved? Vanishingly small. So what COULD get released from said permafrost, as it melts with inexorable global warming? Well, phages: lots and lots of phages. Then some plant viruses, maybe: there have been previous reports of Tomato mosaic virus found in 1999 in glacial ice from Greenland, that was between 500 – 140 000 years old – that was also supposed to be a threat, as it escaped from melting icecaps. To tomatoes, possibly. If they grew in seawater. Yah. Right. But at the same time, considerably more worthy of alarm than Pandoraviruses. Because what our worthy French colleagues did NOT do, in their report in PNAS, was see what ELSE was in their permafrost samples. Seriously: they trawled melting ice from a core sample with amoebae ONLY. This is the equivalent of the 2nd year prac I used to do, when we made students screen water obtained from the environment with E coli to see if they could amplify coliphages out of it. Why did they not do a metagenomic sequence trawl, after filtering out bits of mammoth crap and cockroaches and bits of twigs?? What did they MISS? HBVs that infected Denisovans? And are we SURE that the virus came from that long ago? Has the ice really remained frozen all that time – and is there not the possibility that water didn’t percolate down through cracks and pores in the permafrost, carrying the virus with it, from a more clement environment on the surface?? OK, OK, so it’s a great find, and reasonably worthy of SOME hype. BUT: it is NOT a harbinger of doom, because most viruses will NOT survive 30 000 years worth of entombment in ice, and in any case, would NOT infect humans even if they did. AND I hate the name: “Pithovirus sibericum“? Really?? Viruses are not named like that! Except by French folk who find these strange “amphora-shaped” viruses, apparently.